Seven percent of Americans don't have a bank account, according to a 2015 FDIC survey. If you're one of the 9 million that doesn't, there are alternatives available for cashing your paycheck. Most of these options have associated costs that exceed the charges of some banks, so it is worth considering the feasibility of opening a bank account first. For example, Key Bank offers a "hassle-free checking account" with a minimum deposit of $10. After the first 30 days as an account holder, you can deposit a check and have access to your funds with only a one day hold. If you have an equivalent balance in your account, then you can cash the check immediately. Key Bank can you a debit card associated with the account that is accepted virtually everywhere as good as cash and will be insured against loss. A bank account will enable you to opt for direct deposit by your employer or government agencies like the IRS and Social Security. The money can then be spent on your debit card without the bother of a visit to a bank or check-cashing entity. The following options are worth considering if you have decided a bank account is not appropriate given your circumstances. You may be able to cash the check through the bank which your employer utilized to issue the check. If there's a local branch, stop in and ask if they will provide that service. Also, check with your employer to see if they have made arrangements with the bank issuing its checks to provide this service or a low-cost option. According to a survey by My BankTracker, Citibank doesn’t impose a fee to cash a check under $5,000 that's drawn on their bank, and Capital One will also cash a check drawn on its bank for free. Many banks charge a fee, generally ranging from $6 to $10, though some banks will charge a higher fee based on a percentage of the check amount. A few banks will cash checks from non-customers which are not generated by their bank. Fees will generally be higher for this service. KeyBank, for example, charges 1% of the check, up to a maximum fee of $22.50. Most banks will only cash payroll and government checks and not personal checks for non-customers. Check cashing kiosks exist in many retail and convenience stores. Some provide 24/7 check cashing services while others are only open when the store customer service center is open. Options for receiving payment include cash or payment on a store card at some large retailers. A disadvantage of this option is a fee structure often ranging from 1 - 5%. 7-Eleven, for example, charges .99% of the check amount at their kiosk. Check cashing services for payroll checks, government checks, tax checks, and money orders are available at many Walmart stores for a small fee—$3 for checks $1,000 or less and $6 for checks greater than $1,000 and no more than $5,000. (The limit increases to $7,500 from January to April for tax refund checks.). KMart will cash payroll, government and two-party checks (up to $500) for $1 in some states and free of charge in others. Other retailers, especially grocery stores and some liquor stores, often cash paychecks. With grocery stores, you may need a store membership card to have check cashing privileges. In many cases, there is a fee associated with these services. Banks offer prepaid cards you can get without having to open a bank account. For example, if you sign up for a Chase Liquid card, you can load cash and checks onto your card at an ATM or via an app on your phone. You can then use your card to withdraw money or make purchases. Note that there is a monthly fee for these services. It’s currently $4.95 for the Chase Liquid card. An expensive option for cashing checks is a check cashing store. Check cashing stores typically charge a percentage of the check and a flat fee. Some may impose a fee that's equal to a percentage of the check value. Others may charge a flat fee on top of a percentage fee. For instance, to cash, a $2,000 check, a $5 fee plus 1 percent comes out to a $25 deduction from your paycheck. 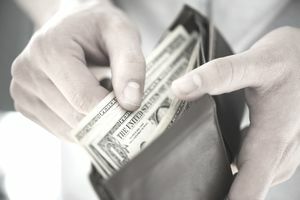 Check cashing stores will often provide an advance on paychecks not yet issued for a sizeable fee and will take the proceeds of the individual's paycheck on its delivery date. These Payday Loans are the most expensive option, and once recipients get accustomed to a schedule for advance payments, they are more likely to continually tap this service at a significant cost. According to the Consumer Federation of America, payday loans can cost $15 to $30 to borrow $100 with interest adding up to 400% over the course of a year. Some individuals without bank accounts approach their highly trusted contacts who have bank accounts and ask them to cash checks on their behalf. To cash a check, you will typically need to provide one or two forms of identification, including a picture ID, like a driver's license, passport, or state photo ID. A government-issued photo ID is the best most widely accepted identification to use.